Caregivers often are unpaid relatives or spouses of people who need assistance with activities of daily living and medical tasks. As more Americans choose to age at home, they require caregivers to make their choice possible. In most cases, caregivers organize medications and make sure their loved ones take them on time, assist them with getting dressed, bathing, and using the bathroom, schedule appointments with health care providers, provide transportation to appointments, make meals, and much more. Because caregivers spend the majority of their time caring for someone else, they benefit from tools that make the job more manageable. That’s why we have rounded up 43 of the most helpful tools and blogs for caregivers. We have included smartphone apps for tracking medication, blogs for reading about how others cope with the demands of being a caregiver, and technology systems that monitor and track the care recipient and alert the caregiver of emergencies or potential health hazards. Please note, we have listed our top 43 tools for caregivers below in no particular order. 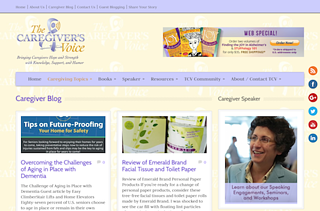 The Caregiver’s Voice is designed to serve caregivers for people with dementia. Brenda Avadian, award-winning speaker, author of nine books, and U.S. News & World Report HEALTH writer, founded The Caregiver’s Voice in 1998 while caring for her father with Alzheimer’s. The blog covers topics pertinent to caregiving such as aging in place, dementia, elder care, independent living, and memory loss, among others. 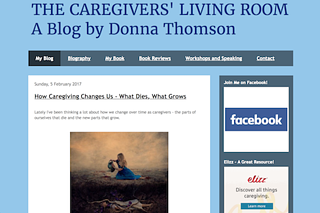 Author of The Four Walls of My Freedom: Lessons I’ve Learned from a Life of Caregiving, Donna Thomson also is a speaker, consultant, advocacy trainer, and blogger at The Caregivers’ Living Room. Thomson’s posts cover everything from quick and easy meal ideas and recipes to empathetic caregiving. 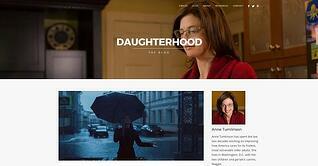 Written by Anne Tumlinson, Daughterhood features advice and tips about caregiving, benefits and wellbeing. Tumlinson has extensive experience in policy and research and is on a mission to share her knowledge and experience with everyday caregivers. 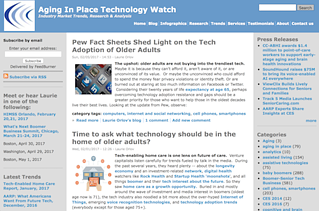 Aging In Place Technology Watch is under the helm of Laure Orlov, a tech industry veteran and elder care advocate. The blog features market research and thought leadership, analysis, and guidance about the technologies that make aging in place possible. Caregivers will gain insight into the tools that can assist you in caring for your loved ones. Terminology Matters: Digital Health or Tech and Aging? The Caregiver Space is a non-profit online community that includes the people and resources you need while you serve as a caregiver. 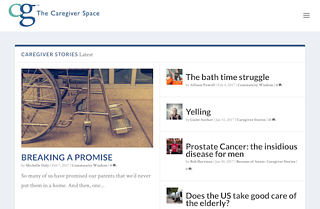 Blog posts include caregiver stories, tips for caregivers, a section for family and friends of caregivers, and posts covering tools for caregivers. Dale Carter helps caregivers be proactive, learn to navigate a crisis or change, and be a parent’s advocate. 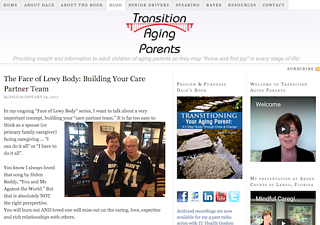 Her blog, Transition to Aging Parents, features posts covering categories such as health, housing, relationship building, safety, and enabling technologies. As someone who served as a long-distance caregiver for her mother and now as a caregiver for her husband, Carter has first-hand experience with handling the demands of caregiving. EldercareABC is an online community for caregivers of aging parents, designed by caregivers of aging parents. The blog is about being connected so that caregivers have access to a caring, supportive group of people dedicated to helping you. eCareDiary, a web community, is based on the founders’ experiences as caregivers for their parents who lived with chronic illnesses such as Parkinson’s, Type II diabetes, and dementia. eCareDiary also is a source of help for families offering online tools, expert content, and resources like their articles. 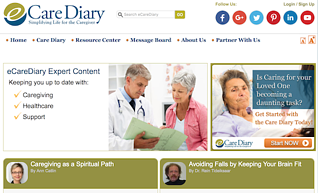 Caregiving.com is a web based community for caregivers to come together and support one another. Support comes through blogs, community posts, courses, podcasts and more. Caregivers know the challenges of caring for a dementia or Alzheimer’s patient, and safety must come first. The Alzehimer’s Store’s door alarm monitor with remote helps caregivers keep on top of loved ones’ movements by alerting you when the door opens. 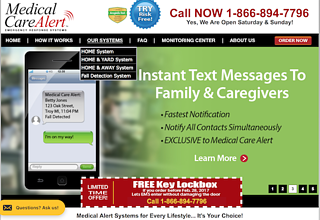 Assistive Technology Services specializes in medical alert systems without monthly fees. 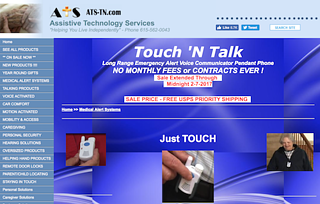 Their Touch ‘N Talk system is a long-range emergency alert voice communicator pendant phone. The care recipient simply touches the button and talks when he needs assistance. Caregivers can rest a little easier knowing that your loved one can reach them more quickly and easily with the Touch ‘N Talk. MaxiAids offers products for independent living to people with visual and/or hearing impairment. 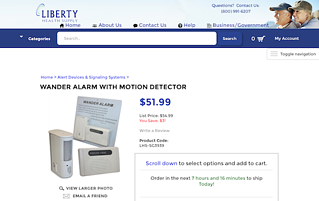 Their motion sensor and pager is a one-to-one system that alerts caregivers of motion detected near your loved ones and helps ensure that they are safe. The Lively medical alert system provides round-the-clock emergency monitoring, missed medication reminders, and more with a stylish safety watch. Busy caregivers appreciate the ease of use the Lively 24/7 system delivers; simply plug the Lively hub into a power source, decide where to place the activity sensors around the home, activate the online account, and place the watch on the care recipient’s wrist. Alarm.com offers technology that powers the connected home and makes life smarter, safer, and more efficient. 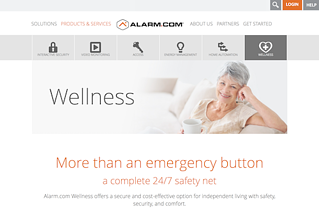 Caregivers choose Alarm.com Wellness because it is an affordable option for ensuring a care recipient’s safety, security, and comfort. 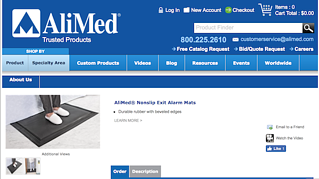 AliMed manufactures and supplies products for healthcare professionals, patients, and caregivers. Their nonslip exit alarm mats are designed to be used with a wireless remote receiver and alarm unit to alert caregivers of the movements of your loved ones. Caregivers spend a great deal of time worrying about your loved ones, and falls are a serious concern. 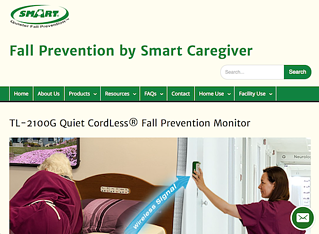 Smart Caregiver’s fall prevention system features their patented Cordless Fall Monitor. 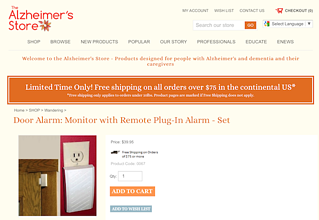 Caregivers can mount the monitor where you need it, including out of reach of your loved one. Caregivers also may choose the components of the system that best suit your needs; options include cordless bed pads, cordless floor mats, and cordless chair pads. 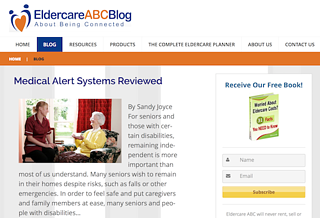 A medical alert system company developing and providing a range of products in three areas of senior care technology, Alert1 helps seniors stay safe and gives caregivers greater peace of mind. 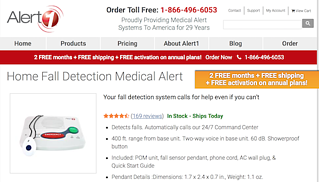 Their fall detection medical alert system calls for help even when your loved one can’t by detecting falls and automatically calling the 24/7 command center. 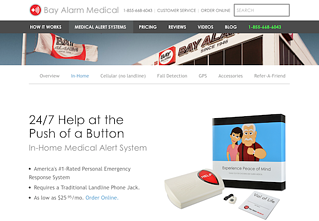 Bay Alarm Medical provides 24/7 medical alert systems for seniors. 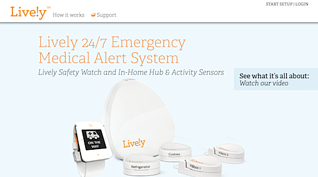 Their in-home medical alert system ensures care recipients receive help at the push of a button. The easy installation saves caregivers valuable time and gives them peace of mind thanks to the system’s reliable, proven technology. 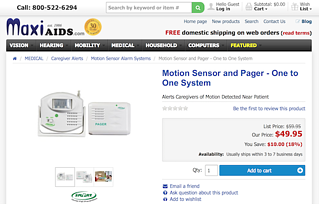 Medical Guardian, a leading nationwide provider of medical alert systems for seniors who wish to live independently at home, offers their Classic Guardian as a cost-effective way for caregivers to ensure the safety and welfare of your loved ones a little more easily. 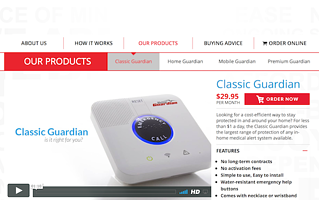 The Classic Guardian provides the largest range of protection of any available home medical alert system. 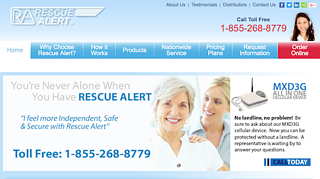 LifeFone offers top-rated medical alert devices that promote independence and security while ensuring a fast response at the press of a button. 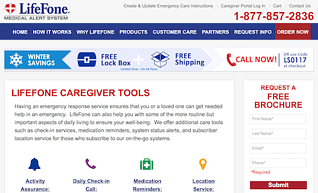 LifeFone also offers a line of tools that are designed for caregivers including medication reminders, system status alerts, and subscriber location service. 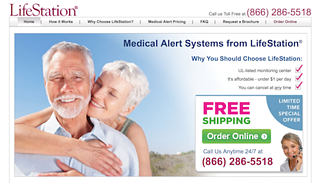 Medical Care Alert provides medical alert systems for seniors that are reliable and affordable. Caregivers gain peace of mind and know that your loved ones can be a little more independent thanks to their Medical Care Alert emergency response system. Caregivers rest a little more easily when they choose the LifeStation medical alert system because your loved ones get help with one push of a button from the monitoring center. Designed by industry veterans, LifeStation medial alarms link care recipients to care specialists who are CSSAA certified. 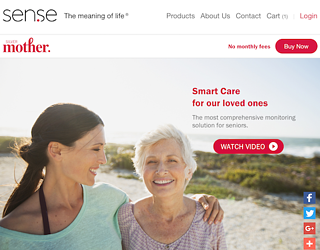 Silver Mother is a comprehensive monitoring system for caregivers and your senior loved ones. Featuring medication reminders, sleep tracking, daily activity monitoring, front door alerts, hydration measurement, and temperature monitoring, Silver Mother offers peace of mind for caregivers simply and affordably. You select the programs that are most relevant to your loved one’s needs and attach a tiny Silver Mother sensor to objects like pill containers, beds, walls, stairs, front doors, water bottles, etc. From Liberty Health Supply, the Wander Alarm with Motion Detection assists caregivers with keeping an eye on your loved one. The remote monitoring device may be mounted in nearly any convenient location and signals caregivers from up to 100 feet away. SAMi, a sleep activity monitor, helps caregivers keep your loved ones safer at night. 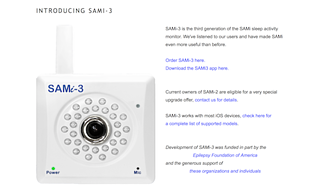 Now offering the third generation of SAMi, the SAMi-3, the alert company honored users’ requests and suggestions and created an even more useful and convenient monitor than previous models. SAMi alerts caregivers to abnormal movements at night without sounding an alarm for normal tossing and turning. GTX Corp pioneers, creates, and delivers smart mobile and wearable technology like the GPS SmartSole. 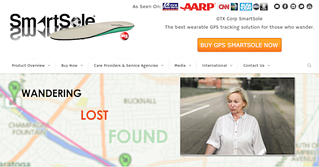 Caregivers rely on the GPS SmartSole to track their wandering loved ones. The wearable hidden tracking device uses GPS and cellular technology like a smartphone and charges like your phone. For caregivers of loved ones with dementia, wandering is a serious concern. SafeLink GPS is a solution for dependable tracking. 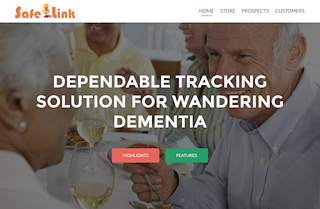 Using a unique artificial intelligence position processing system with ultrasensitive trackers, SafeLink GPS is an accurate tracking tool for caregivers. Wear on belts, as a necklace, on key chains, on walkers, etc. Caregivers avoid a great deal of stress when you know you can locate your loved one in a matter of seconds. PocketFinder+ Personal Tracker is a GPS locator that lets caregivers know where your loved one is and helps you keep him safe. 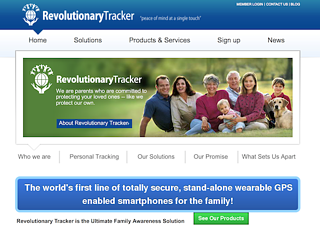 An ultimate family awareness and management solution for caregivers, Revolutionary Tracker is a completely secure, stand-alone wearable GPS enabled smartphone for your loved ones. Caregivers get real-time information on your loved one’s location and status. 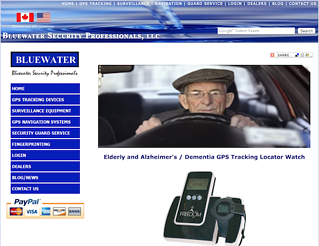 A GPS tracking locator specifically designed for the elderly and people with Alzheimer’s or another form of dementia, the BlueWater Elderly and Alzheimer’s GPS Locator Watch helps caregivers keep track of your loved ones. Better yet, the BlueWater GPS Locator Watch helps caregivers rest a little more easily. The iTraq is a rechargeable global tracking device that combines cellular and GPS tracking. Caregivers gain peace of mind while allowing their loved one with dementia or Alzheimer’s to maintain a bit more independence. 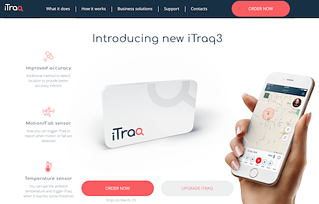 The new iTraq3 features improved accuracy and a motion or fall sensor. Caregivers enjoy the convenience of tracking loved ones and getting alerts on their iOS and Android devices. NETGEAR is a worldwide provider of innovative networking products that keep people connected. Caregivers use NETGEAR’s Arlo smart home security as a video monitoring solution to watch over your elderly loved ones. 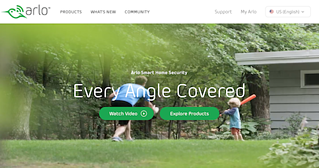 As a remote video monitoring system, Arlo is an affordable and simple solution for remaining in visual contact with your loved one. 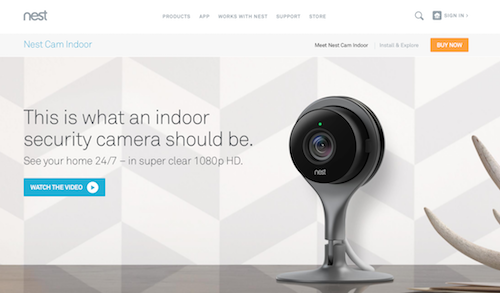 Nest focuses on making simple, human, delightful products that create a thoughtful home. Their indoor security camera allows caregivers to keep an eye on your loved ones 24/7 in crystal clear 1080p HD. Designed to help caregivers know what is happening at home even when you’re not there, the Nest Cam Indoor features 24/7 live streaming and person alerts with Nest Aware. 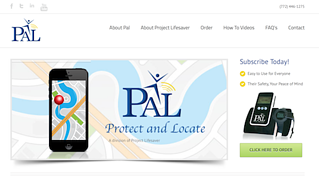 Project Lifesaver is a nonprofit organization that helps quickly locate people with cognitive conditions who wander. Their PAL (Protect and Locate) Tracking system is a tracking device and digital sports watch that protects and locates at-risk loved ones. Caregivers use a portable receiver to get notifications about wandering events through GSM and GPS technologies. 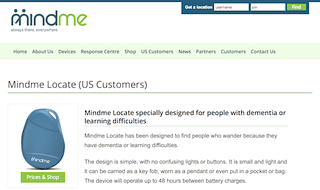 Mindme Locate is designed to find people who wander due to dementia or learning difficulties. Caregivers choose Mindme Locate because of its simple design and lack of confusing lights or buttons. Small and lightweight, Mindme Locate may be carried as a key fob, worn on a necklace, and placed in a pocket or bag. The Medisafe team helps people and caregivers stay on top of health by ensuring they never forget medication times. Research shows that people who use the Medisafe app consistently take their medication more than those who do not use the app. Caregivers won’t forget a dosage again when they download Medisafe for iOS or Android devices. 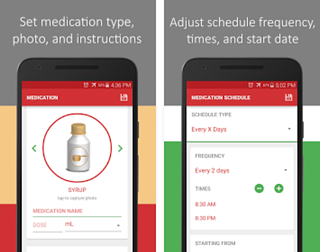 The medication reminder app from Medica, currently available for Android devices, helps caregivers organize your care recipient’s medication list and remind them to take the correct medication at the appropriate time. Caregivers appreciate the flexible medication schedule options, pill and refill reminder, and easy medication log tracker offered by the Medica Medication Reminder. The #1 Best Seller in Pill Dispensers and Reminders on Amazon, the Ezy Dose AM/PM Push Button Pill Planner is a favorite among caregivers because of its ease-of-use design. Caregivers save time by easily pushing buttons to open the organizer to fill it or retrieve medication from inside. 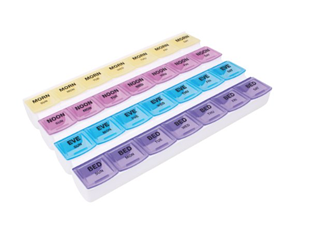 Color-coded compartments with large lettering helps both caregivers and their loved ones know which medications should be taken at which time. With a four-star review from more than 1,500 Amazon customers, Borin-Halbich’s The 7Pack holds seven days’ worth of medication. Each daily dosage box includes three compartments to make it easy to dispense medication in the morning, at noon, and at bedtime. Caregivers enjoy the convenience of the color-coded compartments and the highly organized manner of The 7Pack from Borin-Halbich. 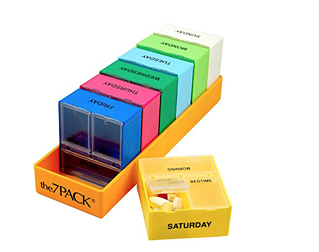 The Apex 7-Day Mediplanner Pill Organizer is Amazon’s #1 Best Seller in pill cases. The weekly tray helps caregivers prepare medications once a week to save time. 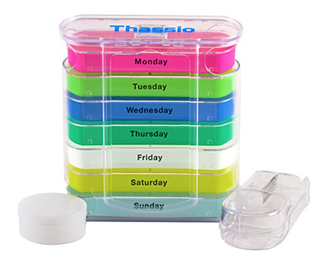 Caregivers also choose the Apex 7-Day Mediplanner Pill Organizer because it features four daily compartments to cover more dosage times than other medication organizers that only allow for three daily doses. Thassio creates quality products for everyday life. Their 7 Day Pill Organizer includes a pill cutter and makes the chore of planning weekly medications easier for caregivers. Each daily case is divided into four compartments and labeled for AM and PM to make dispensing medication just as easy as organizing it. 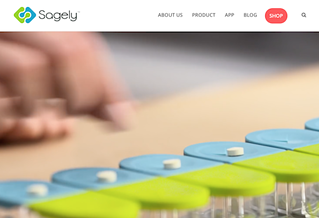 Sagely creates easy-to-use products that allow people to focus on healthy living. Their modern-day pillbox has a large capacity and a magnetized base to keep compartment in place while you fill them with daily doses. Caregivers love the ease with which you push pills through the lids and into the containers for improved loading accuracy. 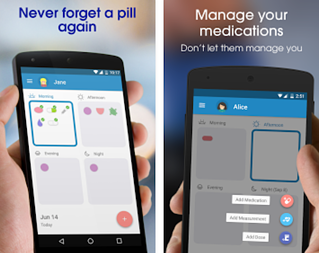 Best of all, the Sagely Smart Weekly Pill Organizer includes a free medication reminder app for iOS and Android devices.